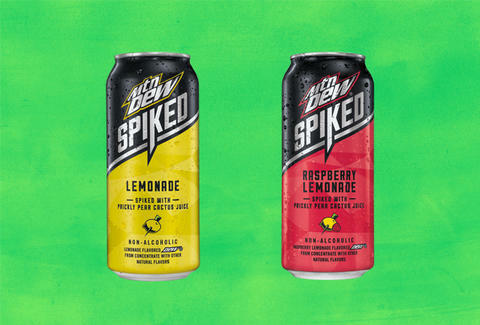 While the name sounds like Mountain Dew wants to challenge Mike's Hard Lemonade, Mountain Dew's new Spiked Lemonade isn't what it sounds like. In the confusing name tradition that includes Bruno Mars not being an astronaut, Mountain Dew's Spiked Lemonade contains no alcohol. Far from being the rebirth of the original Four Loko, Spiked Lemonade, which launches this spring, is made with crushed lemons, real sugar, and a shot of prickly pear cactus juice. It comes in two flavors, lemonade and raspberry lemonade and it may or may not make a good mixer. Calling it spiked when it's not really spiked is a bit comical. PepsiCo is clearly aware of the association because it says "non-alcoholic" right on the can. The company dances around the traditional association with a logo featuring a cactus spine driving its way through a lemon. With the prickly pear cactus juice in there, it's a "spiked" lemonade without spiking the drink. Fair enough. Nonetheless, Dew's recent foray's into flavored variants of traditional Mountain Dew have gone well. The Black Label Dew -- with "dark berry" flavors and "herbal bitters" -- has become popular. It's even spawned two new drinks in the Label Series, which will launch this spring alongside Spiked Lemonade. The White Label Dew is a citrus-flavored version, while the Green Label is an apple-kiwi-flavored Mountain Dew.